Hunt’s Transport Ltd. was founded in 1984 by Greer and Donna Hunt. Today, Hunt’s Transport is at the forefront of the transportation industry offering a diverse global transportation network. Hunt’s Transport offers a wide range of transport solutions in the oil, gas, mining, drilling, industrial, commercial and construction fields to clients across Canada. Their claim to fame is being malleable enough to provide clients with customized solutions that cater to clients specific needs in local markets or nationwide. THE OGM: Why did you choose the transportation industry as a field to commit your career to? Greer: That’s a good question. I would have to say that it comes from my parents’ family business. We were distributors for soft drink and beer products on Bell Island, Newfoundland. This business revolved around transportation, warehousing and storage. Living and operating on an island presented all sorts of challenges. I grew to accept and overcome this and take on a role in the business, and for those reasons, it’s something I came to enjoy and develop—so the challenges of being on an island, actually, turned into the opportunity of my future. THE OGM: What aspects of the transportation business are critical for oil and gas infrastructure, and how does this impact your business? Greer: All aspects of the transportation business are critical for oil and gas infrastructure. Our company, together with our partners Mammoet and McKeil Marine, evolved to be a recognized transportation and logistics service provider. From hot-shot, general freight, over-dimensional loads to heavy-haul and heavy-lift moves, along with our recently implemented barging service, Hunt’s Transport offers a unique catalogue of customized services addressing the aggressive and challenging complexities of special projects. Over the years, we have increased and improved our capabilities and competencies, thus positioning ourselves to take advantage of all opportunities with current and upcoming projects. We look forward to substantial growth in the next few years with Hebron and other projects coming on stream. The OGM: What oil and gas transportation projects are the most significant for Hunt’s Transport, and what role do you play in these projects? Greer: The Hebron Project will create a significant opportunity for Hunt’s, and for many other businesses within our province. This gravity-based production facility for Hebron will offer huge volumes of movements of all types of materials. Handling the challenges presented by these movements is where our team and company will excel. Through our new partnership with Mammoet, Mammoet Hunt’s Atlantic Ltd., we also offer heavy-lift services and engineered heavy transportation, as well as the ability to provide marine services through McKeil Marine. All these solutions come into play making us powerful solutions providers for the oil and gas industries’ needs. 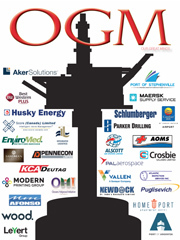 The OGM: What was the most exciting contract you ever received in the oil and gas industry? Greer: There have been numerous contracts over the years that stand out in my mind as being exciting. During the 1990s our company completed one of the largest and longest, over the land, drill rig movements, which gave us some national acclaim in one of the larger oil company’s newsletters. That was fun! Another exciting project was the contract we received to supply all trucking services related to the exploration well drilled by Exxon Mobil. This evolved into numerous time-sensitive movements with shipments coming from various locations throughout North America to Newfoundland for furtherance to St. Pierre. Thankfully, we’ve had many successes in the last 20 years. The OGM: What advice do you have for others looking at developing transportation companies? Greer: The transportation industry continues to struggle with the changes in demographics and the resulting shortage of skilled professional workers. We have to continue to promote our business in ways that will influence the younger workforce to be a part of this exciting and expanding industry. A very important area is to promote and lobby the government in our province to develop a higher level of training for this profession, and to create a designation for our professional drivers, so as to have greater success with interest and recruitment in this field. The more skilled workers we have, the higher the performance and the greater success we accomplish overall. 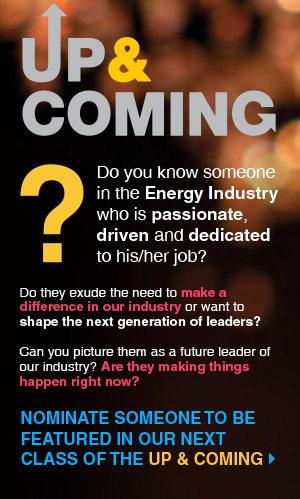 The OGM: Who are your top clients in the energy industry and how do you serve them? Greer: We service all aspects of the energy sector— from the initial oil and gas front-end exploration stages on to the fabrication and eventual development of the different production facilities. Hunt’s Transport has moved numerous drill rigs, most recently drill rig Stoneham 11 for a Nalcor project on Newfoundland’s west coast. Some of the rigs consisted of 70 oversize loads that we transported across the country. Hunt’s Transport specializes in large projects and have been heavily involved in all of the major oil field developers and servicers. For some clients, we customize a total logistics plan which covers the transportation, storage, redistribution and inventory management, so that the process is worry free and controlled completely by one service provider. The OGM: What leadership advice do you have for people in the oil and gas business? Greer: The leadership advice I would give to people in the oil and gas business is that Newfoundland has moved from the early unknown high-risk exploration area to a well-established oil producing supplier. I feel that this was as a result of hard work and training from all levels of government and, especially, the owners of the different projects. Our province and its people over the years have developed an essential knowledge in all aspects of industry. I would ask that we continue in this direction to source and train our people wherever possible to enhance the industry and, of course, our province. The OGM: What does the future look like for Hunt’s Transport? Greer: With our dedicated, hard-working team, along with our diverse partners, we are poised to move our company to a new and exciting level. We have created and proven another option to move freight to and from our province, and offer our clients open- minded, alternative thinking, out of the box solutions at all times, to better improve and expand the services we offer. Over the past few months we have added six acres of lay down area in Argentia to support our barge; we’re expanding to a new 60,000 square foot building in Cambridge, and are continually adding equipment to our fleet and professional members to our team. 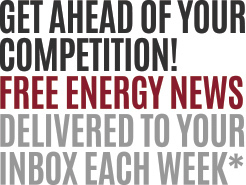 It’s exciting times for us in the energy industry, and I have enjoyed the last 20 years of growth and development. It’s one road I was happy to take!